In thinking about bookstores that provide so much to passing the torch of our culture, I don’t have to go far from home. In our little village in the Montclair section of Oakland, there is a tiny bookstore with a big reach and a big heart. A Great Good Place for Books has the feel of a neighborhood hang-out. Sunday mornings, when the farmer’s market is in full swing, it’s an easy place to drop in and linger for a while. Chances are owner Kathleen Caldwell will greet you by name. And any kids you’ve brought along will not only love the cozy reading arrangement in the kids’ section, but will welcome the plate of cookies found there any day of the week. But amazingly, for such a small space, it has a big impact. 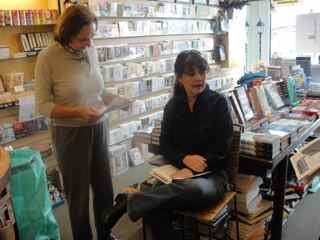 Along with first-time and local authors, big-deal writers come there too for readings. I attended a standing-room only event a few months ago when Michael Chabon read; last week his wife Ayelet Waldman packed ’em in too. 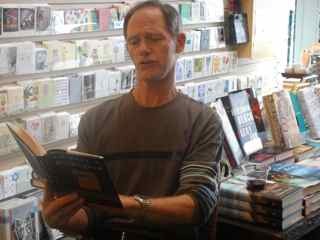 And last year, I heard a local author extol the power of bookstores in the Bay Area to really move books. He cited as an example the role a Great Good Place for Books had in turning The Kite Runner into a best-seller by promoting it, using it in the bookstore’s book club, and by the power of old-fashioned word of mouth among the store’s very literate clientele. Two Sundays ago, I had the fun of attending an event to celebrate To Kill a Mockingbird ‘s fiftieth anniversary. During an all-day celebration, writers and readers alike took turns reading passages from Harper Lee’s classic. I met some of my writer pals there, including James J. Patterson, Lowry McFerrin (see below) and Linda Watanabe McFerrin. It was Linda who noted, before reading, how impossible it would have been fifty years ago to imagine that in the first decade of the 21st century we would have an African-American president. There is much to celebrate.